Real estate in the Trails village is mainly upscale and ranges from ultra luxurious custom estates upwards of 13,000 square feet to moderately priced family homes in the 2,000 square foot range. Neighborhoods such as Mountain Trails, also called "Half Acres," features luxury custom homes on lots a minimum of half acre in size. There are some lovely condos at Pacific Homes at the Trails (aka Deerfield) with quality interior finishings for those who desire a smaller, low maintenance home. The Trails is located in the 89134 zip code, below Sun City Summerlin, east of the Arbors, west of the Hills, and the Hills South, and north of the Crossing. Almost 15 acres in size, this park offers expansive grassy areas, three children's playbrounds, trails and shaded picnic areas. Located in the Arbors is Arbors Paseo Park, Sports Park, Tennis Park, Tree Top Park and Cottonwood Canyon. Also closeby are The Hills Park and Oxford Park in the Crossing. To the north is the Red Rock Country Club and Arroyo Golf Club, while just south is Bear's Best Las Vegas and Siena Golf Club. The Trails Village Center at Summerlin offers 175,000 square feet of shopping with almost 50 shops including retail outlets, groceries, CVS Pharmacy and restaurants. Also close by are the shops of Downtown Summerlin. 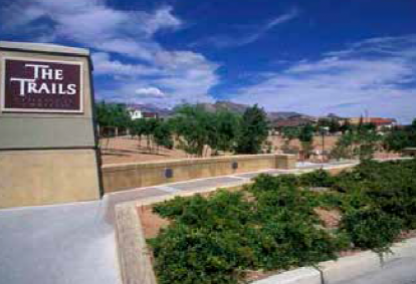 The Nevada Balley Theatre and the Summerlin Library are also situated in the Trails village. A 24-hour Fitness Super Sport is also available. Leslie will be happy to assist with any questions or information you require about real estate in the Trails or other Summerlin subdivisions. Please do not hesitate to email or call: (702) 321-1763 for more information.